If you have been on my site or any of my social media platforms, chances are you’ve seen me with a bottle of Buda Juice in my hand! 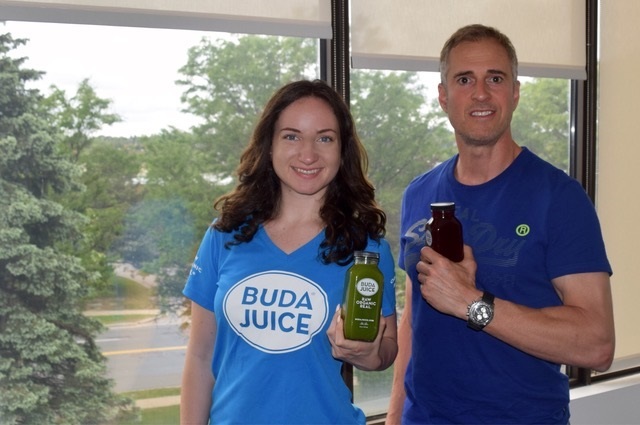 It comes to no surprise that I am a big fan of their juices, however, I wanted to know more about Buda Juice the company, as well. Safe to say I am a fan of their juices and their background now! Buda Juice starts with the story of Bernard Lucien Nussbaumer and Horatio Lonsdale-Hands, Swiss and British renaissance entrepreneurs who grew up together in Lausanne, Switzerland. The two re-connected in Dallas, where they now both reside with their families, and picked up their friendship where they left off…only this time they traded in Swiss cheese and chocolate for raw fruits and veggies. Lately, Bernard and Horatio realized they were trapped in the world of technology, having forgotten to fully breathe and truly live. They felt the urge to step back and recharge. Juicing became the ultimate way to restore and balance their energy, and marry their love of great food with their taste for the pure and the natural. There are few places in the world as close to Mother Nature as the lush green of the Swiss Alps in summertime. With that as the backdrop, the two toasted the idea of Buda Juice in the Nussbaumer chalet in Gstaad. From this unplanned journey back to their roots sprouted the concept of Buda Juice. The partnership brings together the creativity of Bernard, who is also an avid yogi, car racer and photographer, with the restaurant expertise of Horatio, passionate windsurfer and co-founder of ZuZu Handmade Mexican Food, which he turned into a national award-winning Fast Casual chain. The two are now excited to share their experience and knowledge by “bottling” it, literally. Raw, Organic, and Real: We are USDA certified* organic and our juices are 100% raw. We keep it raw by hand-squeezing our juice in a cold-press, avoiding heat and air that can destroy valuable nutrients, vitamins, and enzymes. Refrigerated: Our produce is kept refrigerated from farm to bottle to consumer. Currently: We serve nine juices, two boosts, and one nut milk. Restricted Diets: All of our products are certified organic, vegan and gluten-free. Eco-friendly: We recycle our pulp and use glass instead of plastic to reduce our carbon footprint. We also recycle the glass bottles. Hand-squeezing our juice in a cold-press ensures the purity of the nutrients stays intact, as heat destroys valuable enzymes, vitamins and minerals. This means every drop of Buda Juice delivers the maximum amount of nutrients possible. This is in sharp contrast to most juice bars that use centrifugal juicers or even blenders, as both generate a substantial amount of heat. We also avoid pasteurization and high pressure processing (HPP) for the same reason. At Buda Juice, we bottle every last delicious drop straight from the cold press into custom glass bottles and into our refrigerators, ready for our customers to grab and go.